It ordered all Japanese American to vacate their places of residence and move en masse into concentration camps setup up to accommodate them. This occurred in the midst of World War II after the Japanese bombing of Pearl Harbor. Although the United States was already at war with Nazi Germany, no such mandate was imposed upon the many German-Americans living throughout the country. This mass evacuation imposed a severe burden on the lives of those citizens who were forced to abandon their homes and properties for the “duration” of the war. As a result of the EO, 272 Japanese Americans were forced to abandon their homes, properties and friendships and moved to Manzanar – one of the ten Japanese concentrations that were erected throughout the nation. Manzanar was located at the foot of the Sierra Nevada mountains in California's Owens Valley and ultimately housed 10,000 individuals. This courageous and tenacious couple continued to speak out throughout the war regarding the injustice of the forced and massive relocation. As a matter of fact, their publication was the only newspaper throughout the entire country to take such an unpopular position. The Woodwards actually hired high school students – Paul Ohtaki, Sa Nakata, Tony Koura and Sada Omoto to report from Manzanar on the daily lives and challenges facing the inmates of that camp. 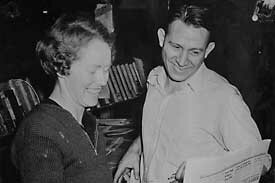 After the war, Walt and Milly Woodward remained strong local activists of the Bainbridge Island community especially in regard to local schools, construction of a new library and public transportation. Walt ultimately stepped down as editor of the Review in 1963; the newspaper was sold in 1988. Walt worked for a time on the editorial board of the Seattle times Milly returned to her career as a high school teacher and died in 1989. Walt passed away in 2001 at the age ninety-one. Walt and Milly Woodward were recognized posthumously by the Asian Journalists Association for their outspoken opposition to the involuntary internment of Japanese-Americans. They were recipients of the, Special Recognition Award. Finally, on March 30, 2009 (the sixty-seventh anniversary of the internment), the ground-breaking ceremony took place to begin construction of the Bainbridge Island Japanese American Exclusion Memorial to honor those Japanese-Americans of Bainbridge Island who were moved into concentration camps.